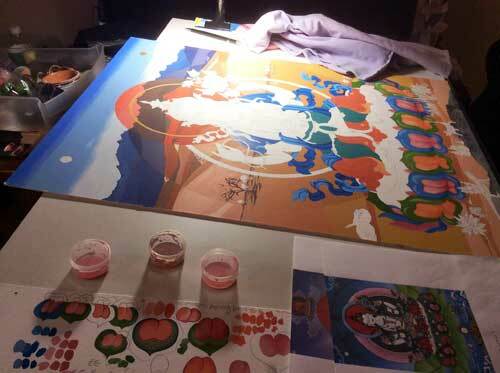 Each year I spend 3 to 4 weeks in the US East Coast where I offer many different thangka drawing and painting classes at different venues. 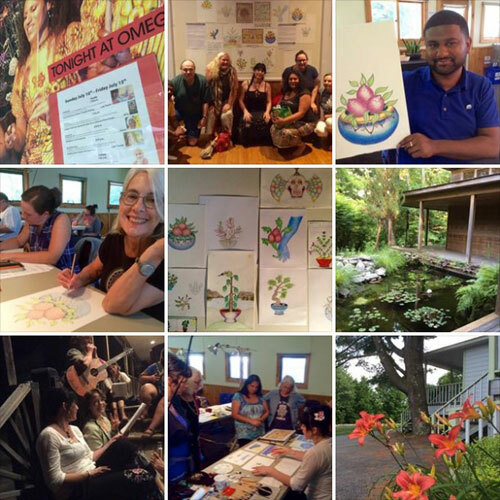 My 2016 East Coast tour started by offering a 5 day thangka drawing & painting retreat at the renowned Omega Institute, where I taught my students about the Medicine Buddha and how to work with his meditation and mantra, as well as all about the most used healing plants in Tibetan medicine, what illnesses they are used for and how to draw and paint them according to the old Tibetan Buddhist Tradition. A very wonderful week! 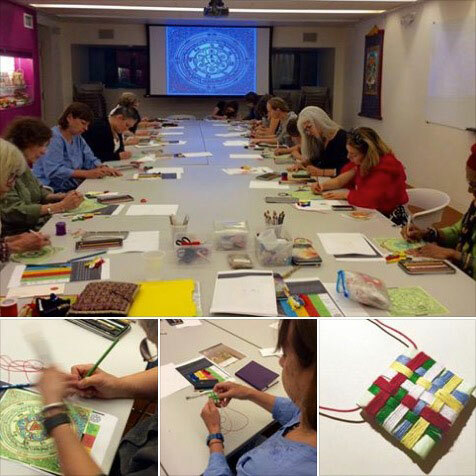 Next I offered an evening class at the Rubin Museum of Art (which I consider the best museum on Himalayan Art world wide), where the participants learned everything about Tibetan Buddhist Amulets and learned how to create a protective amulet connected to Chenrezig (Buddha of Compassion) and Vasudhara (female Buddha of Abundance & Prosperity). This is the first exhibition connecting well-known deities represented in Nepalese art to rituals and festivals surrounding the rainy season, or monsoon, and highlighting the importance of the seasons to the culture and everyday life of Nepalese people. The exhibition will offer visitors a new understanding of the region and its art, which is already renowned for its high quality and aesthetic appeal. 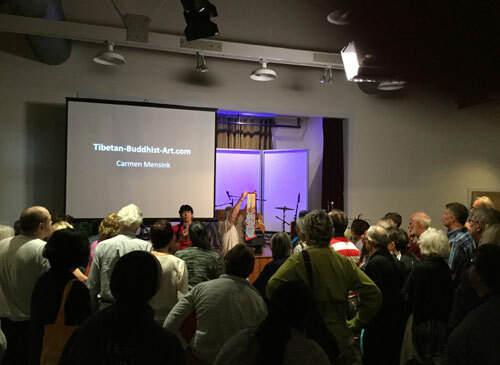 The East Coast thangka tour ended with a wonderful weekend course at Tibet House, that was organized by the Shantideva Meditation center. 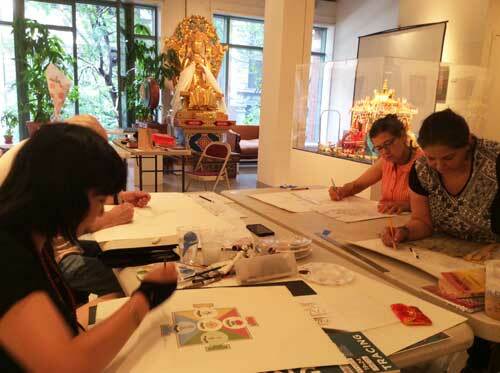 In this weekend students learned how to draw Chenrezig (named Avalokiteshvara in Sanskrit) following the Buddhist tradition, learned all about his symbolism in Tibetan Art, and how to work with his meditations and his famous mantra Om Mani Padme Hum. 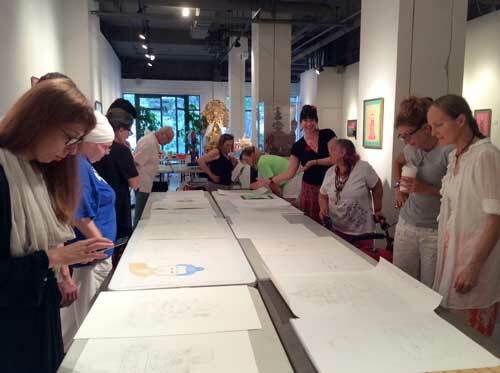 New people started with drawing the face of the Buddha first. On Sunday evening, after the course, we went out for dinner & drinks, as it was my last day in New York before I flew back to Amsterdam. 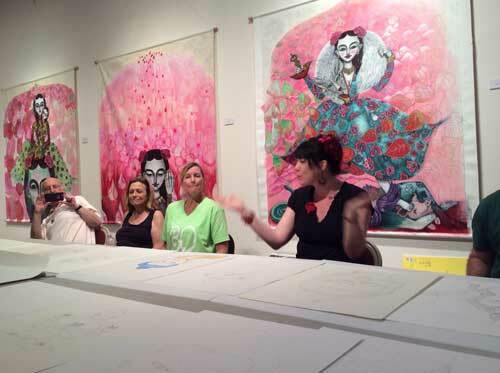 A new invitation for me to teach this year was at the Alix Experience, an international membership of dynamic, engaged women professionals who travel globally for business and leisure. 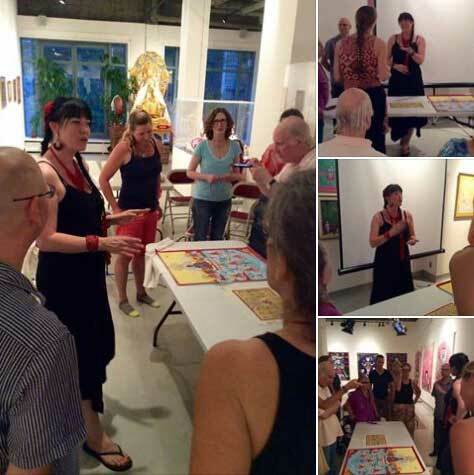 I offered an evening class on Tibetan Buddhist Symbols (the Eternal Knot, the Lotus Flower and the Eyes of the Buddha), combined with drinks, food & networking. 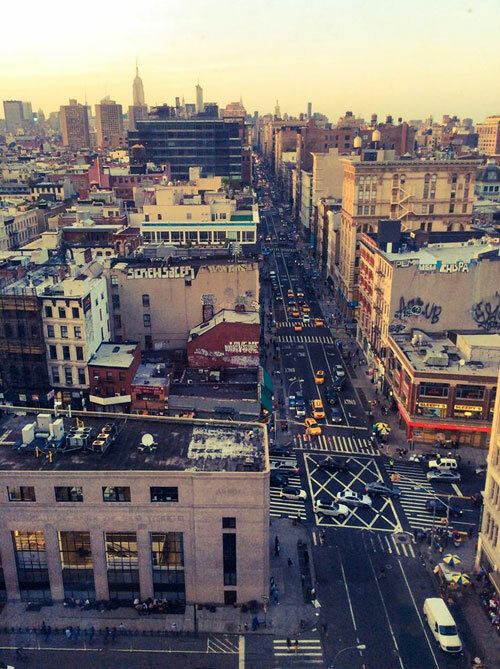 Their office on Broadway has amazing views of the city. 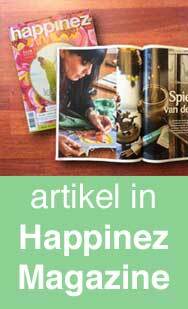 On the days in between the group teachings I can be hired to offer private thangka teachings on different subjects. 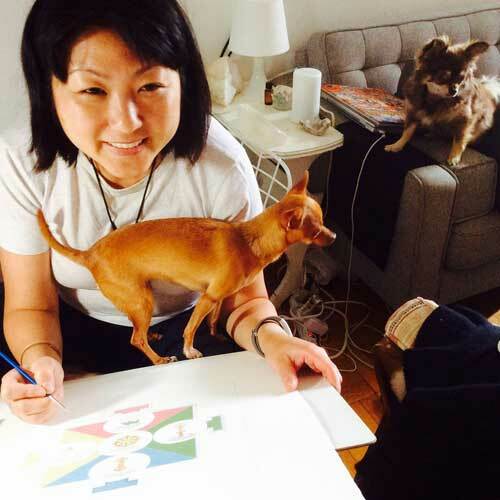 And I’m teaching Anjie Cho (and her dogs Javier & Pearl!) 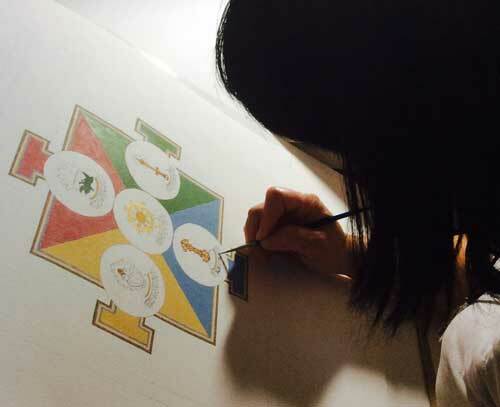 how to draw and paint the Mandala of the 5 Buddha Families. NOTE: From 2017 on, we will be offering teachings in the West Coast as well. 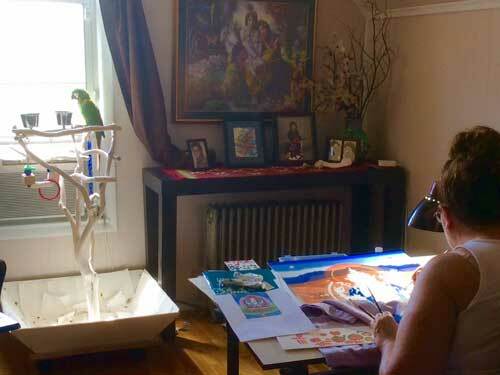 Are you in the US and do you want to learn how to draw and paint Tibetan Buddhas and symbols?